Summer makeup has nothing on Chanel this season—Lucia Pica is making us vie for an elevated beach beauty look that's perfect for the warmer climate. Vivid coral painted the models' lips, bringing to mind the neon zinc smeared on the faces of lifeguards back in the '80s. While the lips did all the talking, glowing complexion (with a subtle flush) and iridescent eyes completed the look beautifully. Now all you need is a straw hat and you're ready to hit the sand. 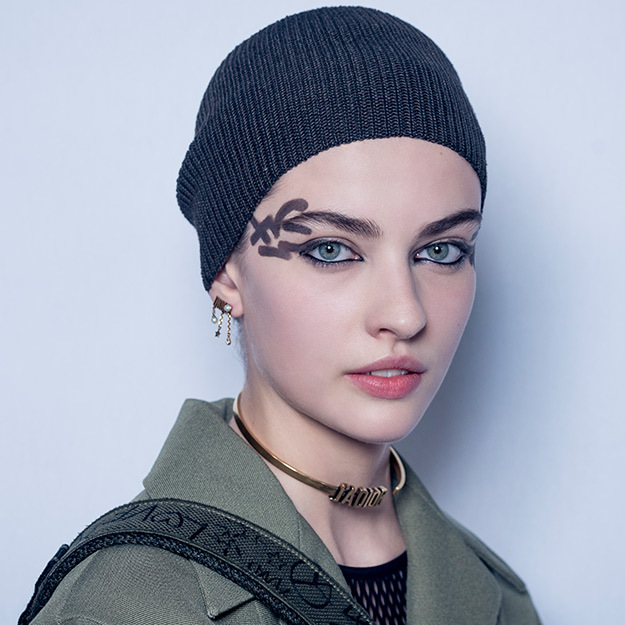 The makeup at Dior perfectly complemented the dance-inspired collection—models sported a unique motif around their temples, drawn by Dior Makeup Creative and Image Director Peter Philips with waterproof eyeliner in black and anthracite gray. Philips also applied eyeliner to the waterline on the lower lash line to accentuate the eyes, but in intentionally imperfect strokes for that lived-in look—so now you've got good excuse to pull off eyeliner even if your skills aren't faultless. Brows were kept simple, while the hair was wrapped around the heads to mimic a dancer's meticulous hairdo. 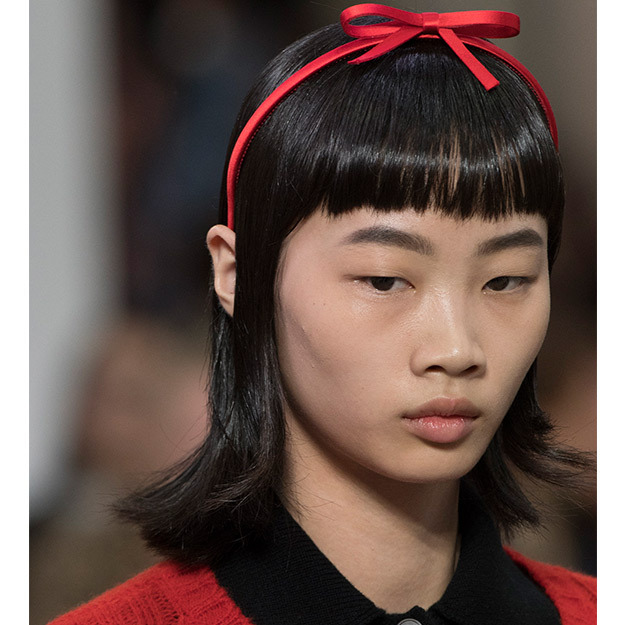 At Miu Miu, models pulled off a range of edgy retro hairdos, from baby bangs to choppy bobs that are calling out our inner rebellious streaks. Hairstylist Guido Palau was inspired by "tough girls in the late 60s and early 70s", hence the extreme (and uneven) lengths. Blunt bobs with subtly curled ends carried an air of cool-girl insouciance, while hair accessories in the form of bow headbands lent a feminine touch to the look altogether. The crystal-dotted makeup trend isn't going anywhere just yet. Prada gave us some ideas on wearing it last season, but this SS19, Valentino upped the ante with lavishly-studded eyelids and lips. Pat McGrath worked her magic with a graphic smokey eye dusted with plentiful green Swarovski crystals, such as this gorgeous look on Kaia Gerber. Chloé upgraded the quintessential French girl look with three must-haves this season: A bold lip, tousled hair (effortlessly styled to look un-styled), and a sultry smokey eye. The lip colour of the moment is likely a berry or classic red, while tresses are slicked back from the face and teased for a windswept look. We're digging the lightly-smudged smokey eye—with added definition on the lower lash line for a dramatic effect. Just when we thought wet hair might take a backseat this season, Saint Laurent proves us wrong with more than a handful of looks with slicked-back locks. This season, the wet hair trend took on a just-showered countenance, rather than posing as a carefully-combed effort. Models on the runway only needed a slick of sunshine (in punchy yellow) over their eyelids to complement their look.